Tucked up close to the Austrian border, as little as an hour away from the Slovene capital Ljubljana, getting to Bled by train, bus or car is a relatively painless experience. Ljubljana Jože Pučnik Airport is located approximately half way between Ljubljana and Bled, and you can expect to pay around €45 for a taxi into town. Buses are considerably cheaper (€5.40, with up to 19 connections on weekdays, but virtually none on weekends) although you have to transfer in Kranj. There are also up to six direct shuttles per day (€13). You can see the full schedules on the airport's website at www.lju-airport.si. Buses leave every hour on the hour from the main bus station in Ljubljana and take about 70 minutes to make the journey. Very close to the town centre at the northern tip of the lake, the bus station (glavno postajališče) has a kiosk outside selling chocolate, soft drinks and cigarettes. To get to the city centre, walk along Cesta Svobode until you hit the water. The walk takes only few minutes. Schedule, prices and special tourist packages (bus ticket + attraction ticket), can be found on the official Ljubljana bus station website at www.ap-ljubljana.si. Bled has two train stations, but unfortunately neither is located in the centre of town. Over 20 trains a day from Ljubljana call at Lesce-Bled station which is on the main line, but is 4km away, meaning you will either have a lengthy hike or short bus ride into town. The other station is Bled-Jezero a couple kilometres to the west, which sees up to five trains a day from the capital, however you have to transfer at Jesenice which can lead to a total journey time of almost 3 hours. 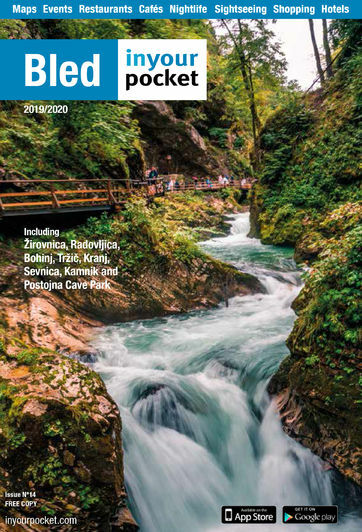 Check out Slovenia Railways' incredibly user-friendly website for a complete schedule and prices at www.slo-zeleznice.si. From Ljubljana take the A2 highway northwest out of the city and follow the signs for Kranj or Jesenice. From Austria, pass Jesenice following signs for Ljubljana. Bled is well sign-posted. The journey time is around 40 minutes from Ljubljana, and it may get very crowded on Sundays in season at the end of highway. Once you've reached the town, there is ample parking available, but most of it must be paid between the hours of 07:00-20:00, with prices ranging from €0.50-2 per hour or €3-10 per day. Inquiring about the various options at your hotel prior to arrival is usually a good idea. For those with electric cars, there is a free charging station on the lower level of the parking garage at Hotel Krim near Bled Sports Hall - the key can be collected at the hotel's reception. The Slovene version of BlaBlaCar without the stupid name (it just means 'transport' in Slovene, although according to Google translate it does mean 'seduction' in Russian), since time immemorial Prevoz.org has been the preferred method for students and other budget travellers to get around Slovenia faster and cheaper than public transport. And the same applies for those travelling to or from neighbouring countries or any former Yugoslav states - we frequently use it to get between Ljubljana and Belgrade, as the €25-30 cost and five-hour journey time can't be beat. Perhaps the only downside is that the site is only in Slovene, but is no obstacle that Chrome's auto-translate feature can't overcome, and you also need to register or link your Google account to be able to see the contact numbers of the drivers. Available 24hrs, they also offer train station, airport and other long distance transfers.